Thought that you would get away with not having to view ads by taking to your smartphone device? Well you're parade of "winning" is officially over. Of course, the bad news is hinted in the title. I'll go ahead and explain. Yesterday, the site implemented TrueView in-stream ads for the mobile platform, and like you've become accustomed to on the desktop, you'll begin to notice these commercials on your smartphone and tablet. If you don't notice the difference between TrueView ads and other YouTube ads, it is the ability to skip the ads after about 5 seconds. You all know what I'm talking about -- you're bound to see it eventually if you don't have an ad blocker installed. This sorta represents the end of an era, but we all understand that content producers have to make money. You can take pride in knowing that the publisher is getting a little money, and (most likely) more content will continue to flow. 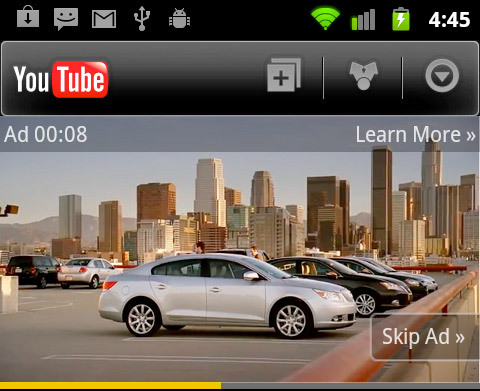 Do you use the YouTube on your smartphone? You can answer in the poll below. Do you view YouTube on your smart phone?